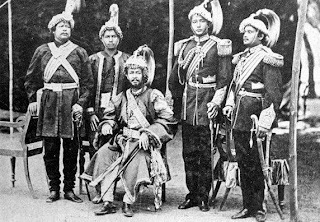 There is an interesting story on how Maharaja Jung Bahadur might have changed the future course of Nepalese history. Every sound, except his own snoring, intruded into his deep slumber and warned him of potential danger; a gift of the Gods that had helped make Jung the supremo of Nepal during a very turbulent period in Nepalese history. Jung Bahadur sensed danger where none was imminent and because of this trait he had survived that fateful night at the Kot. Jung heard the sound even in his deep slumber, somebody was there in his bedroom, tiptoeing around his bed. The possibility of an assassin entering his heavily guarded palace and lurking in his bedroom was remote but then Jung was always prepared for the unexpected because he knew that he had a rich collection of enemies who wanted him dead. Jung always had a loaded gun by his bed, at arm's reach. It was a silver paneled musket with four barrels that was a personal gift of Queen Victoria with her name inscribed on it. Jung lunged for the gun at the same time shouting aloud, "khabardar"! The intruder ran out of the room and Jung followed cocking the hammer. He dashed through the corridor of his huge palace and gave chase. To his alarm the intruder was now running to the bedroom of his favorite wife, Putali Maharani! Jung panicked. Breathlessly he barged into his wife's room only to find Putali Maharani shielding behind her a shivering 10 year old boy, his nephew Narbir Jung! The youngster liked prowling around the palace. Nepalese history would know him by the name of Maharajah Bir Shumsher Jung Bahadur Rana from 1885 A.D. onwards. During these years Maharajah Jung Bahadur Rana relied on his youngest brother Dhir Shumsher to assist him in carrying out state affairs. Jung had been disappointed with some his brothers such as his second brother Bam Bahadur and his third brother the disloyal Badri Narsingh. Bam had died while holding the post of prime minister making Jung take the helm of his government once again. Badri was already exiled to Palpa following his betrayal. Dhir's first wedded wife the mother of his eldest son Narbir Jung had died giving him birth. Dhir had remarried to raise another family. Putali Maharani took pity on Narbir and wanted to bring the motherless boy to Thapathali Durbar and to raise him together with her own son Baber Jung, both similar in age and temperament. Maharajah Jung Bahadur had concurred. He could not deny a wish of his favorite wife. 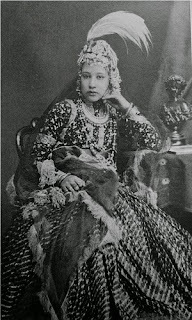 Maharajah Jung Bahadur's second wife, the mother of his two elder sons Jagat Jang and Jeet Jung had died. He had remarried his principle consort Badamaharani Hiranya Garva Kumari in 1853 A.D. She had four daughters in quick succession, but no sons were born. One of Jung's lover and a trusted spy in the royal household, Putali Nani or Mademoiselle Butterfly was taken by Jung as his wife in reward for her invaluable leaking out of palace secrets; Jung could correctly gauge the shenanigans of the king, queen and the crown prince. She was given the title of Maharani after he became the Maharajah of Kaski and Lamjung. A son was born and Jung gave him the name of Baber Jung, naming him after the famous founder of the Mughal dynasty of India, Emperor Babur. Friction within the household of the aging Maharajah started almost imperceptively at first but gained tempo with every waxing and waning moon. Jung's elder sons Jagat and Jeet were married to royal princesses that gave them perks and privileges even beyond Jung's means. Jagat had for himself built a palace at Manohara, that "stole everybody's heart" as the Sanskrit meaning implied. He was ambitious and by the roll of succession promulgated by Jung, Jagat was the successor to the father's title of Maharajah of Kaski and Lamjung after his death, whereas the post and power of the prime minister went to Jung's brothers. This did not sit well with Jagat. He wanted both those posts badly. Baber Jung, the son of Putali Maharani grew to be a most capable man, a brave soldier and an astute administrator and when he came of age he was rewarded with the post of Lt. General in the army in 1868 A.D. He was his father the Maharajah's favorite son and aide-de-camp. Meanwhile the chasm between the powerful elder sons Jagat and Jeet and rest of Jung's family began to widen. Maharajah Jung himself started to be wary of Jagat's power and ambition. He had witnessed how his brother Badri Narsingh had turned against him and he was enough of a wily old fox to preclude any rapacious move from his son Jagat. He started to rely on Baber and his junior sons even more. Out of the blue a tragedy struck Jung Bahadur from which he never recovered. His favorite son Baber succumbed to consumption as the killer disease tuberculosis was then known. He was in the prime of life. The year was 1876 A.D. Putali Maharani was devastated by this loss and her only solace was that Narbir, now renamed Bir Shumsher by Jung Bahadur, was with her, her loyal and loving adopted son. She wanted him to succeed the Maharajah instead of her stepson Jagat as her future would be bleak indeed if Jagat became Maharajah. He and his wife the princess royal would certainly take revenge on Putali Nani, the palace spy. The following year 1877 A.D. saw the passing away of the strong man of Nepal. Two power bases would compete for supremacy culminating in the bloody coup d'état of 1885 A.D. Imagine if Jung Bahadur had shot the boy Bir Shumsher that night. Perhaps the Shumsher brothers' coup against Ranoddip would never have taken place. The course of Rana history would certainly have changed. Mr subodh rana how your mistaken that badri narsingh conspired against his brother but let me tell you this is totally false and not true ...he was framed by shumsher brothers because of this misunderstanding he was exiled to vanaras and when jung bahadur knew about the truth he called badri narsingh back but he didnt returned and he spent his whole life in vanaras(as he was deeply religious) until his last breath!